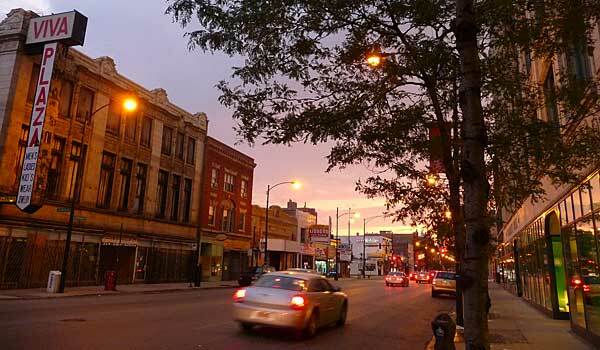 East Village Association | West Town Chicago: What's next for Chicago and Ashland? What's next for Chicago and Ashland? Is the Chicago-Ashland intersection a strip-mall prospect? The north side of Chicago Avenue has for-sale signs posted at 1604-08, 1614 and 1620 W. Chicago. A purchase inquiry on another building was reported lately to East Village Association directors. A listing pictures the 1620 property as a condo with balconies added, but the longstanding concern with the buildings across from the West Town Branch Library is that they might not be long standing. In 2008, EVA aired neighbors' interest in potential turnover of Chicago Avenue tracts. The Chicago-Ashland block came into focus a year later when EVA asked Ald. Manuel Flores to look into whether property on the northwest corner of Division and Ashland might be bought up and demolished. In our last meeting with Alderman Flores, we discussed apparent efforts to consolidate parcels at the northwest corner of Ashland and Chicago. The East Village Association has not taken an official position on the future of these properties, as no development proposal has yet surfaced. However, the block includes several architecturally significant buildings with large contiguous storefronts. New mixed-use development in the area typically consists of small floor-plate commercial condominiums. The Wicker Park Bucktown Chamber of Commerce has identified the lack of large storefront spaces as a limiting factor in the redevelopment of the commercial district, so plans for this block should be monitored closely. The inquiry came after Milwaukee Avenue from Ashland and Damen joined the list of Chicago landmarks. The landmark designation in 2008 gave commercial property owners a 12-year property tax break for major renovations. East Village residents wondered if the same tactic might revive development on Chicago. A blog post drew a lively discussion on the notion of Chicago Avenue landmarking. But preservationists were focused instead on Division Street, where a Commonwealth Edison substation was being demolished. Like Milwaukee Avenue, Chicago Avenue retains an intact stretch of ornate early 20th-century commercial buildings with a lively mix of uses  the 1914 W. Chicago building rose in the vaudeville era as the Alvin Theater. The West Town library is a former Goldblatt's department store that EVA saved from demolition in 1997. A property tax break is not likely to attract business to Chicago Avenue. But it might encourage developers to rehab rather than raze parcels now in play. It would be a crime to put a parking lot on that corner. It would affect the character of the neighborhood a half mile in every direction. Really important that doesn't happen.